Wer ist der gebürtige Angolaner? Lumengos politische Karriere verlief rasant: Seit drei Jahren politisiert der 45-jährige Jurist für die PSR im Bieler Stadtrat. Letztes Jahr wurde er für die SP in den Grossen Rat im Kanton gewählt. Nun darf er für die nächsten vier Jahre zusammen mit Parteikollege Hans Stöckli Biel und Umgebung im Bundeshaus vertreten. “Die Wahl freut mich sehr”, sagt Lumengo, “besonders nach den heftigen Attacken der Freiheitspartei”. Das sei eine “grosse Befriedigung”. Nach einem Autounfall zeigte ihn die in Biel bekannte Freiheitspartei FPS (von Polizeidirektor Erich Scherrer) wegen pflichtwidrigen Verhaltens an und betitelte ihn im Internet als Lügner. Für das Vergehen wurde Lumengo gebüsst. Seine Wahl sei eine Antwort der Bevölkerung auf die Kampagne der SVP. “Ich bin ein schwarzes Schaf, das gewählt wurde”, sagt er in Anspielung auf die SVP-Plakate. Lumengo will sich im Parlament für die Integration von Ausländern und deren Rechte einsetzen. Das Bildungswesen und die Bekämpfung der Arbeitslosigkeit liegen ihm ebenfalls am Herzen. Nachdem er in Schweiz eine Aufenthaltsbewilligung als politischer Flüchtling erhalten hatte, studierte Lumengo in Freiburg Jura und arbeitet heute als juristischer Berater am interkulturellen Begegnungszentrum Multimondo in Biel. Far right wing clipped despite Swiss People’s Party’s victory jig!! A much exposed right-wing member of the Swiss National Council NR Ulrich Schlueer has lost his mandate after this year’s election despite the phenomenal result of the Swiss People’s Party in the Swiss National Council. Ulrich Schlüer was interviewed before by The Independent in connection with the campaign about the black sheep posters during his election. 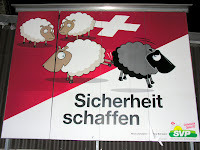 He had been identified with the black sheep campagne even before the pre-election riots in Berne, Switzerland. …Dr. Ulrich Schlüer as runner-up will be in parliament again by taking the MP seat of Maurer! For more detailed results for both the parties and its elected members in both chambres, click National Council (Nationalrat), Upper Chamber (Ständerat) and Overview in German. Provisional Results of Swiss National Council as of 21 Oct, 9 p.m. The poster is not the creation of a fringe movement, but of the most powerful party in Switzerland’s federal Parliament and a member of the coalition government, an extreme right-wing party called the Swiss People’s Party, or SVP. 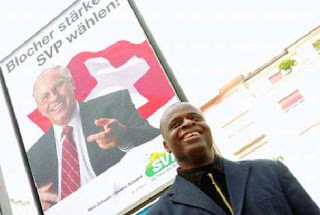 It has been distributed in a mass mailing to Swiss households, reproduced in newspapers and magazines and hung as huge billboards across the country.The poster is not the creation of a fringe movement, but of the most powerful party in Switzerland’s federal Parliament and a member of the coalition government, an extreme right-wing party called the Swiss People’s Party, or SVP. It has been distributed in a mass mailing to Swiss households, reproduced in newspapers and magazines and hung as huge billboards across the country. About 28% of the voters are expected to elect MPs of this party. The people who vote are not extreme right-wing, but the methodology can be called “extreme right wing”. 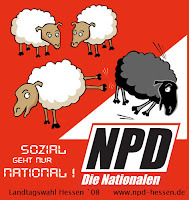 Extreme right-winger NPD in Germany obviously likes the methodology. But still, the program of the Swiss People’s party should not be compared with any movement abroad. As voters prepare to go to the polls in a general election on Oct. 21, the poster — and the party’s underlying message — have polarized a country that prides itself on peaceful consensus in politics, neutrality in foreign policy and tolerance in human relations. Suddenly the campaign has turned into a nationwide debate over the place of immigrants in one of the world’s oldest democracies, and over what it means to be Swiss. Actually, there were more extreme people’s initiatives in the past. 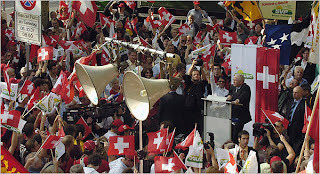 One of them asked for a referendum vote that the Swiss constitution should generally limit the portion of foreign residents in this country to 18% (September 2000). This was before the bilateral treaty with the European Union regarding free movement of workforce within Europe came into effect, but still AFTER the number of foreign residents had already exceedeed the hurdle of 18%. As part of its platform, the SVP party has begun a campaign seeking the 100,000 signatures necessary to force a referendum to let judges deport foreigners after they serve prison sentences for serious crimes. The measure also calls for the deportation of the entire family if the convicted criminal is a minor. Well, the new initiative in fact goes like this: Bottom line: It aims to expel from the country all foreign citizens who commit a crime or who abuse the social system. It is feared that, if it is the supporter of a family who will be subject of such a “spell”, the whole family (under given circumstances) may face deportation. I didn’t explicitly find this in the draft though. 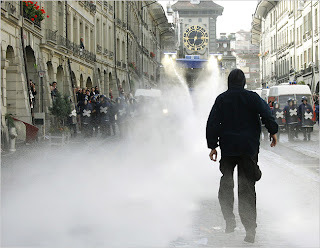 A week ago, a march of several thousand SVP supporters in Bern ended in clashes between hundreds of rock-throwing counterdemonstrators and riot police officers, who used tear gas to disperse them. The opponents of the rally, organized by a new group called the Black Sheep Committee, had tried to prevent the demonstrators from marching to Parliament. They didn’t like it. It reminded them too much of the Nazi marches of the thirties. Exponents of two left wing parties including the Green Party and a local community officer stirred up this anger against the SVP party. Out of their hiding places, once the police was busy in other areas downtown, the Black Bloc activists (not black sheep) started to beat down women, children, musicians, their instruments, anything that came in their way on the Bundesplatz, benches, tables, and completely devastated the square of the SVP festivities in front of the Parliament House (Bundeshaus). The NY Times also mentions the new election campaign video “Heaven and Hell” which contrasts riots like last weekend’s with the SVP heaven. Now they (SVP) managed to provoke enough anger among left wing activists in order to stage a reality show in the Swiss Capitol with black bloc devils destroying the SVP heaven. You are currently browsing the Swiss Reviews blog archives for October, 2007.